This is the smallest working kukri manufactured by Khukuri House Thamel. The blade measures six inches and therefore the name. It is very light yet very effective and most important, it is very easy to transport. 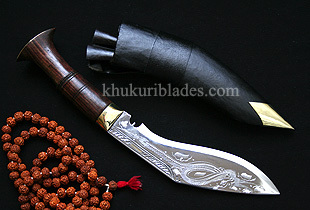 It is also the replica of orginal Nepali Bhojpure kukri. Because of its cute size, it is famous among teens and is the size young lads in Nepal come across. It is a good domestic utility tool and highly recommended for camping and trekking and good as gifts because of its size. This 6" mini jungle is also carved with dragon on both side to add more beauty. The kukri can be used and can be kept for display also.